There are many variables that can lead to crooked cuts when using band saw blades. These common causes include worn or improper blade guides, too many teeth in the cut, feed pressure that is too high, low band tension, a fixed vise that is not square or a saw table that is not level with the blade, and last but not least- improper blade tracking. 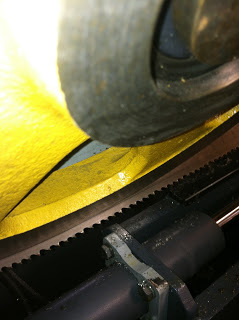 Attached is a picture of how a blade SHOULD look like as it sits on the wheels. Notice how the teeth are not riding on the wheel? If the teeth of a band saw blade ride too far back and come in contact with the drive wheel or idler wheel, the set is damaged. This will lead to a blade cutting crooked as well as premature wear on the wheels themselves. Setting your blade tracking is a fairly easy procedure on most band saws, and will need to be adjusted periodically. If you have questions, need us to help with your tracking, or need assistance with anything related to band sawing- call me!